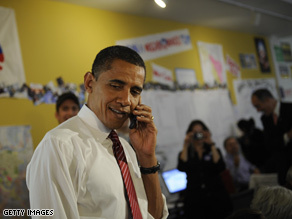 Above: Pre-election Obama makes a slightly smoother call. WASHINGTON (CNN) -A Florida congresswoman – convinced she was being prank-called by a Barack Obama sound-alike – hung up on the actual president-elect Wednesday. Florida Rep. Ileana Ros-Lehtinen was told by an aide that Obama wanted to speak with her. According to a statement released by her office, the Republican congresswoman cut off the caller, telling him she thought “this is a joke from one of the South Florida radio stations known for these pranks.” She then hung up. Obama’s future White House chief of staff, Rahm Emmanuel – a fellow congressman – then called her to let her know she’d actually been speaking with the future commander-in-chief. Ros-Lehtinen, convinced the call was another hoax, hung up on him, too. Finally, an aide told Ros-Lehtinen she had an urgent call from Chairman Howard Berman, chairman of the Foreign Affairs Committee. Still suspicious, Ros-Lehtinen urged the California Democrat to recount a story only both of them would know. Berman passed the test - and told her she had, in fact, hung up on President-elect Obama. When an amused Obama called again, Ros-Lehtinen he was either “very gracious” to reach across the aisle by contacting her, or “had run out of folks to call, if you are truly calling me.” Otherwise, she said, Saturday Night Live “could use a good Obama impersonator like you.” The Obama transition team declined comment on the incident. On Tuesday, Secretary of State nominee Hillary Clinton also spoke with Ros-Lehtinen by phone, relatively uneventfully. In fact she is the ranking member of the house foreign relations committee, a moderate, and possibly the most promient cuban-american politician. Thats probably why obama called her.